As I was putting plant materials on the right side of the bin yesterday evening I thought that I’d post a short update on how the composting is going. You can read how it was built and what it looked like when it was started for a frame of reference. As you can see we’re adding to the right now and the left has reduced considerably. The left was having difficulties getting going but an addition or two of grass clippings from my dad (thanks Dad!) helped speed things up this summer. Paired with regular watering and turning, I think we’ll be able to use the left side in a few months. Let me tell you about those grass clippings: they were hot! We’d dumped the clippings on top of the pile and let it sit for awhile and one day I went to turn it and could feel the heat radiating off the pile. It wasn’t quite like the first photo here, but you get the idea…very warm! That site also has good information on hot composting, which isn’t what we’re doing, though I do want to try to get a little better about being somewhere in the middle between cold and hot composting. Unfortunately that will require me to search out greens more, meaning driving around in neighborhoods on weekends looking for bagged clippings. I’ve done this before, but sometimes I wig out and worry about encounters with people wondering why I’m taking their bags of grass clippings. Plus, you have to be a little wary about chemical use on those clippings. So, the left side is breaking down well and the right side is still being built. I did add three bags of pine needles I got from the side of the road in a neighborhood last weekend and then last night I attempted to clean out some vegetation down at the pond and put that on top of the pile. When leaves start falling around here in a month or two that will be a good time to get more browns (carbon) to add to the pile. I love that it is situated right out of our back door and close to the kitchen so I can dash out while I’m cooking and toss kitchen scraps in. Chris put in the water hose a month ago and now it is even easier to throw water on the pile. The feral cats outside will sometimes go in and scavenge; I’ve found avocado pit out in the middle of the garden before that they’ve carried out. In the winter I saw them cuddled up there for warmth. There’s no shortage of information on composting online, so do some research and start your own pile. Awesome! We’ve been thinking about composting. We might get one of those spinning barrel things cause we live in the middle of the woods and I worry about racoons/bears/etc. digging their way through the pile. My cold compost is going slowly as anticipated. I would really like to try hot composting. I need to be more attentive with turning the pile, and it is admittedly difficult to turn it in the bin. I don’t think I could maintain an open bin/pile here without upsetting neighbors! I have been composting in a small bin for the past 10 months with the intentions of building a bin very soon. Yours seem so simple and easy to deal with. I will have to piggy-back on your design. 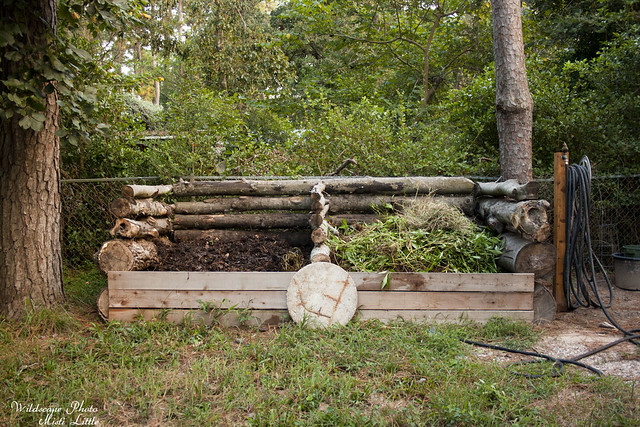 Misti, I love how you used the logs as part of the bin … such a cool idea! Thanks for stopping by my corner of Katy! Wow. That’s pretty amazing. I was hoping we’d have more time to take a tour of your house while we are in town, with the garden, bees, etc, but I don’t think we will! Unless we do it at night with headlights!